The Merchants Row dining room offers fine seafood and New England Fare in an elegant setting. A full breakfast menu is served daily, followed on Sundays by an exquisite brunch buffet with Emily Dickinson or one of our other notable neighbors. Lunch is served midday, followed by a traditional afternoon tea. Dinner is served each evening, and is an experience which should not be missed. Reservations are suggested for all meals except breakfast. The Village Forge Tavern serves up lively entertainment at night and our lunch and dinner menu all day long. The Liberty serves lunch, dinner and a Sunday Breakfast Buffet in a casual setting. The Tap Room serves as a watering hole and meeting place for both townsfolk and guests. Weather permitting join us on the front porch for lunch, dinner or a late night snack while you view beautiful Monument Square. 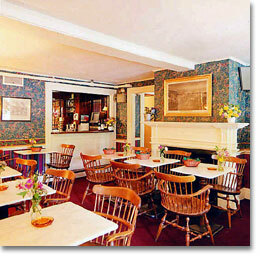 A Late Night Innkeepers fare menu is available to cap off your evening or try one of our homemade desserts.